You can assign properties such as color and linetype to individual objects, or as default properties assigned to layers. 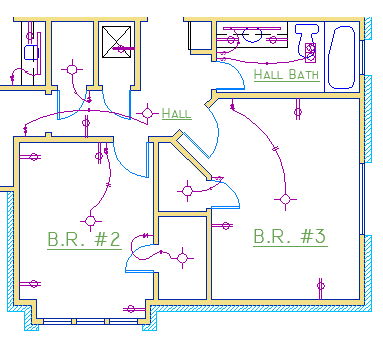 In the following drawing, the walls, exterior stone facing, doors, fixtures, cabinetry, HVAC, electrical, and text were created using different colors to help differentiate between them. The Properties palette is an essential tool. You can open it with the PROPERTIES command (enter PR in the Command window), you can press Ctrl + 1, or you can click the tiny arrow in the Properties panel on the Home tab—whichever you prefer. The Properties palette displays a list of all the important property settings. You can click any of the available fields to change the current settings. 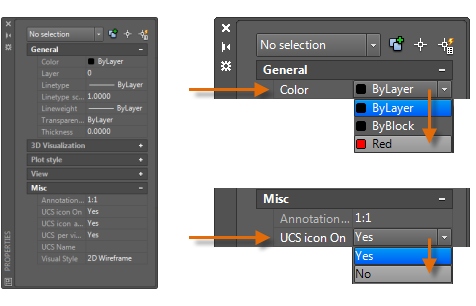 In the following example, if no objects are selected, the current color will be changed from ByLayer to Red and the UCS icon will be turned off. You can use the Properties palette to verify and change property settings for selected objects. 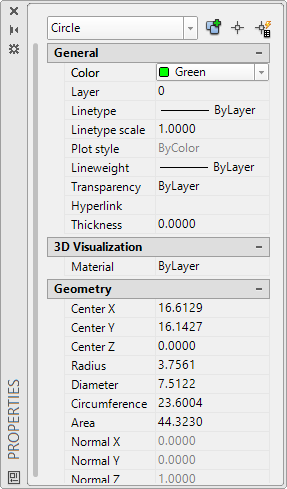 If you click an object in your drawing to select it, here is what you might see in the Properties palette. Notice that the current properties for the selected object are displayed in the palette. You can change any of these properties by clicking and changing the setting. A property that is set to "ByLayer" inherits its setting from the layer. In the previous example, the objects that were created on the 20 ELECTRICAL layer are purple because that is the default color of the objects on that layer. If you select several objects, only their common properties are listed in the Properties palette. If you change one of these properties, all the selected objects will change in one operation. Selecting objects is covered in more detail in the Modifying topic. Note: To clear the current selection, press Esc. The Properties palette takes up a lot of space. For quick access to the most common properties, use the Properties panel. As you can see in this example, the listed properties will all be determined by the current layer. The Properties panel works the same way as the Properties palette. When you select an object, the current property settings are replaced by the properties assigned to the selected object, and you can use this panel to easily change the properties of one of more selected objects. For a fast way to copy the properties of a selected object to other objects, use the Match Properties tool, or enter MATCHPROP or MA in the Command window. Select the source object, and then select all of the objects that you want to modify. Dashed and other non-continuous linetypes are assigned from the Properties panel. You must first load a linetype before you can assign it. In the Linetype drop-down list, click Other. This action displays the Linetype Manager dialog box. Click Load. Choose one or more linetypes that you want to use. Notice that dashed (non-continuous) linetypes come in several preset sizes. Click Show/Hide details to display additional settings. 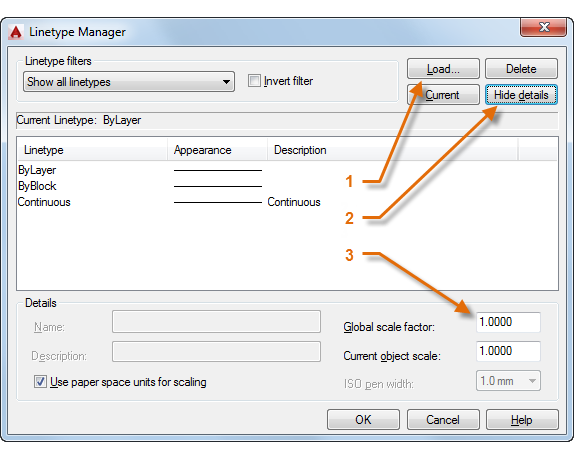 Specify a different "global scale factor" for all linetypes—the larger the value, the longer the dashes and spaces. Click OK.
Once you've loaded the linetypes that you plan to use, you can select any object and specify a linetype from the Properties panel or the Properties palette. 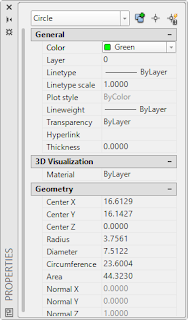 Alternatively, you can specify a default linetype for any layer in the Layer Properties Manager. The Lineweight property provides a way to display different thicknesses for selected objects. The thickness of the lines remain constant regardless of the scale of the view. In a layout, lineweights are always displayed and printed in real-world units. Lineweights can also be assigned from the Properties panel. 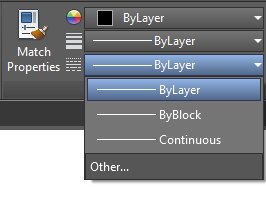 You can leave the lineweight set to ByLayer, or you can specify a value that overrides the layer's lineweight. In some cases, the lineweight previews look the same because they are displayed in approximated pixel widths on a monitor. However, they will print at the correct thickness. Tip: It's usually best to leave lineweights turned off while you work. Heavy lineweights can obscure nearby objects when you use object snaps. You might want to turn them for checking purposes just before you print. 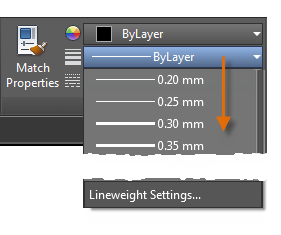 To control the display of lineweights, click the Lineweight Settings button at the bottom of the lineweight list. 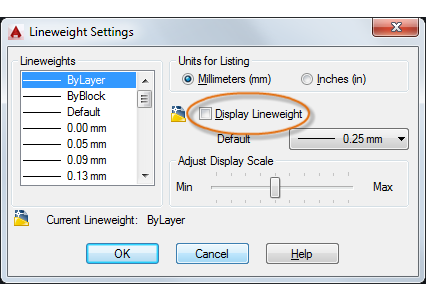 In the Lineweight Settings dialog box, you can choose whether you want to display or hide lineweights.